Welcome to Foggy Mountain Hunting Scents & Lures. We have deer lure, deer scents, deer attractants as well as moose lure, and bear hunting scents. 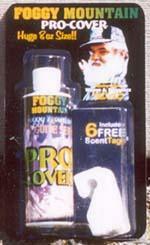 Foggy Mountain also has a full line of cover scents and food lures too. Plus, BearGuard - The world's best leather waterproofing Thanks! ProCover - You're only human, but you don't have to smell like one anymore! Proven for over 25 years. Giant 8 ounce size and 6 FREE ScentTags too. A bear can't resist the sweet scent of pink bubblegum. Bear love it! Bears love the scent of mint. This concentrated scent carries a long way! There is something about the smell of good vanilla that covers a man's scent and doesn't spook the deer. Bear love its sweet scent. This one is a good one, we think you'll like it. Ahh! Anise - the sweet smell of licorice. There is probably some scientific reason why this works so well, but we don't need science to show us what we already know. Use Foggy Mountain Oil of Anise as both an incredible bear lure or as a great cover for deer hunting....it is that simple! Deer love to yard up in those dense stands of cedar. It doesn't take a rocket scientist to know what you want to smell like....This Cedar is just the right blend of oils and scents to duplicate the real scent of cedar on the wind. Pine is one of the best universal cover scents and our Pine is pretty fine! In the north woods, hemlock are everywhere and its distictive scent makes it a perfect natural cover. You may not know the difference between evergreens, but deer sure do. The northern Spruce forests are good hunting and Foggy Mountain Natural Spruce makes it just that much better! Natural Earth - this one has long been a Foggy Mountain favorite. Bowhunters love it! Human odor is the hunter's biggest enemy (other than the anti's, of course). Odor Equalizer neutralizes human odor instantly. No more spooked deer. Foggy Mountain Acorn Food Lure mimics the nutty aroma of wild acorns. Deer love it! Unique adhesive strips - apply to back of hat and deerflies are history! Contains no chemicals or pesticides. 12 strips to a package.